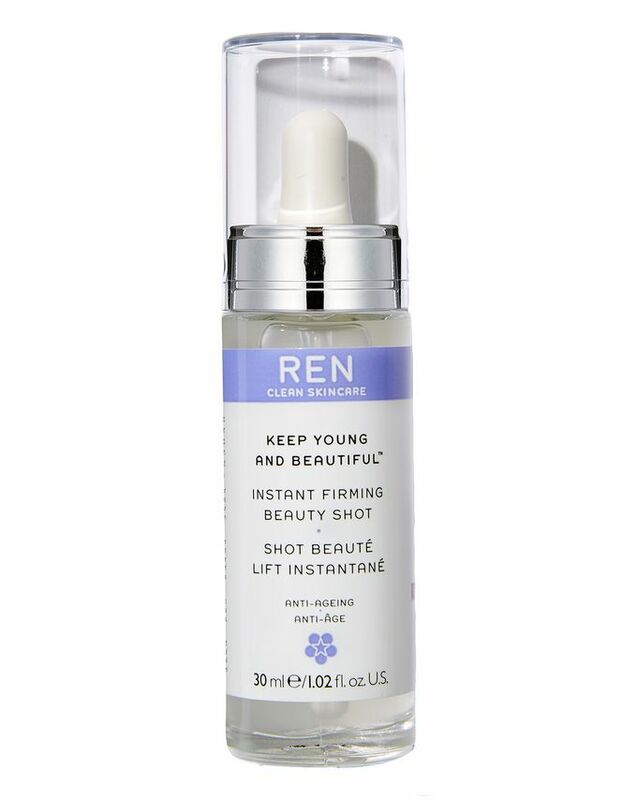 By encouraging elastin synthesis – the fibres responsible for skin’s strength, stretch and tension – REN CLEAN SKINCARE’s Keep Young and Beautiful Instant Firming Beauty Shot is ideal for all those whose skin needs a lift. Just 2 – 3 drops applied directly to clean face (and neck!) will ‘perk up’ your skin within minutes – ideal ahead of a special event, or whenever your skin’s showing signs of fatigue. And the benefits build on themselves, so not only does this miraculous elixir plump your skin and grant a dewy freshness, but also assists longer-term moisture retention and resilience, so your skin becomes better equipped to repair and protect itself. Your face will feel cushiony soft, smooth and ready for moisturiser and/or foundation – and if you need a pre-lunch boost, just apply sparingly over make up and pat gently ‘til absorbed. It’s like spanx for your visage (at last!). 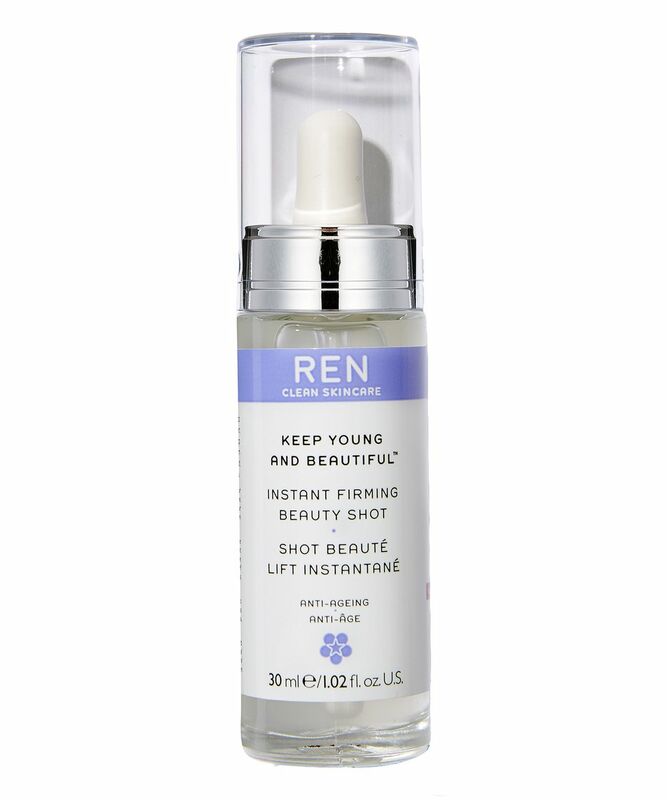 A unique gel-serum, REN CLEAN SKINCARE’s Keep Young and Beautiful Instant Firming Beauty Shot has immediate, ‘lifting’ and plumping effect; infusing skin with a liquid matrix of hyaluronans to provide an intensive moisture boost which in turn, reduces wrinkle depth and helps to counteract sagging. The benefits are both instant and cumulative – Hyaluronan 1 irons out fine lines and wrinkles upon application, while Hyaluronan 2 gradually ‘remodels’ and tautens the skin over time – so with consistent use, you’ll soon see an improvement in the texture, tone and quality of your complexion. Wonderful product. The skin is smooth and glowing after applying. Will purchase again for sure. This is a lovely serum to use! It brightens my complexion and seems to help my makeup glide on smoothly and last much longer without creasing that it does with a primer. It doesn't feel super smooth when applied as it is absorbed extremely quickly. This is a positive point for me as I seriously sandwich my skincare and it can become quite time consuming between each step. Will definitely be re purchasing! I received this as a sample and immediately fell in love! It gives that instant tightening feeling. I feel that it does help to make my 30's looking skin to stay looking youthful, as some believe I must still be in my early 20's. Well combined with my current anti ageing skincare. I'm already on my few last drop of my first full size bottle, definitely repurchasing.